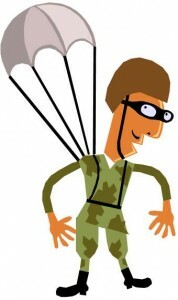 Do you need a parachute when you jump out of a plane? Every business, if they engage in social media, needs a policy in place. The social media channels you use are a direct line to your consumers (and competitors). Everything happens in real time – as soon as you hit send your message or tweet goes out to potentially thousands of people. Get your message wrong and you could find yourself in serious hot water. You must decide what your company’s line will be in the case of defamatory comments being made about it. How will you react to positive comments? Who will be monitoring your social media activity and who will be engaging with your followers? Social media is an excellent tool for businesses to use but, especially for larger companies, it can be a potential mine field so you must ensure you have a social media policy in place before you begin to dabble. Before you go any further check out this useful post on Mashable – 10 Must Haves For You Social Media Policy. Engage and enjoy social media, but make sure everyone knows what they’re doing.